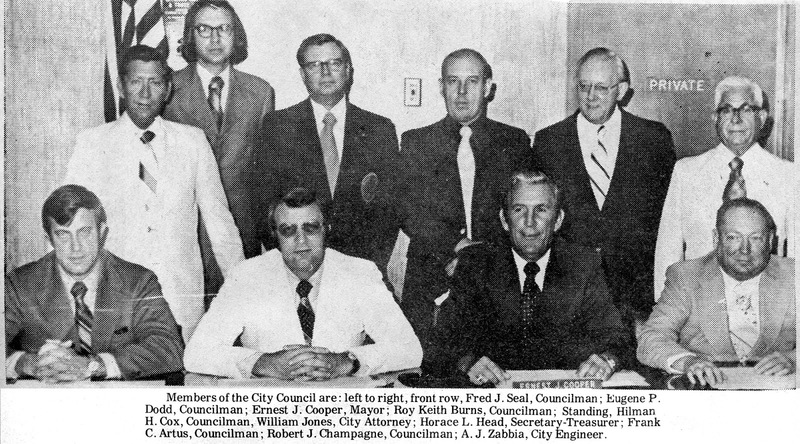 About 44 years ago, in October of 1973, the City of Covington took out a two-page newspaper ad to showcase photographs of the city officials, commissioners, and city employees. Here are those photographs. Click on the images to see a larger sized version. What was going on 100 years ago this week? The following link is provided by the Library of Congress and its Chronicling America service. 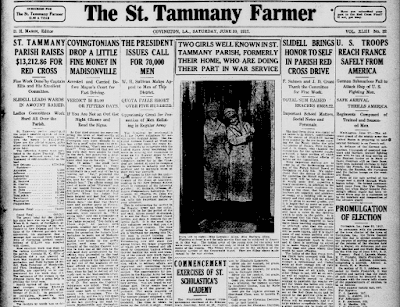 CLICK HERE for a link to the St. Tammany Farmer edition of June 30, 1917. It was a big day in Covington when the first traffic lights were put in service at selected intersections. Here are two articles from the St. Tammany Farmer in January of 1929 taking note of the new traffic control innovation. Click on the image below for a larger, more readable version. A quiet place in Abita Springs to have a cup of coffee, eat a pastry and unwind. 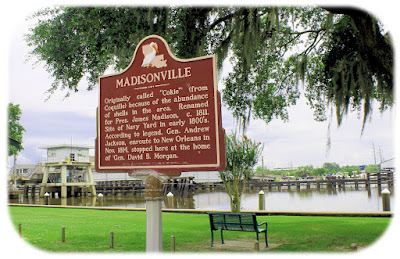 The history of the town of Madisonville is given, in brief, at the following webpage. CLICK HERE to go to the webpage. The historical marker in front of the Madisonville town hall. 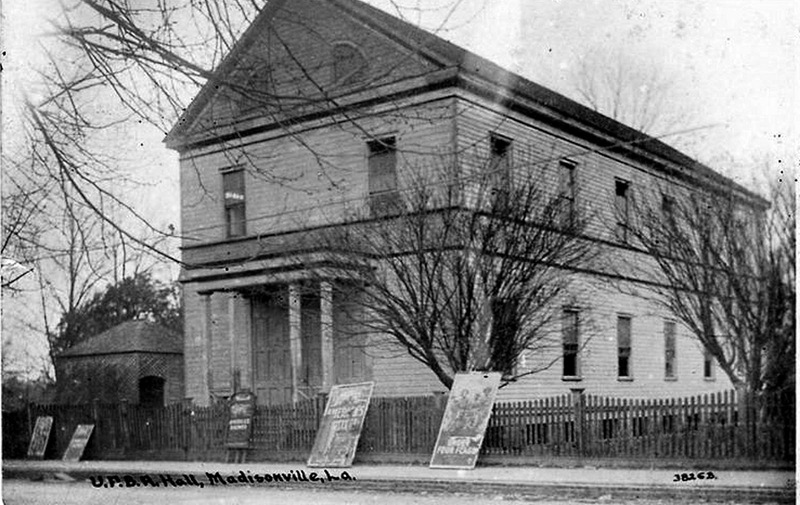 The Madisonville area chamber of commerce also has a history of Madisonville on its webpage. CLICK HERE to see that historical account. 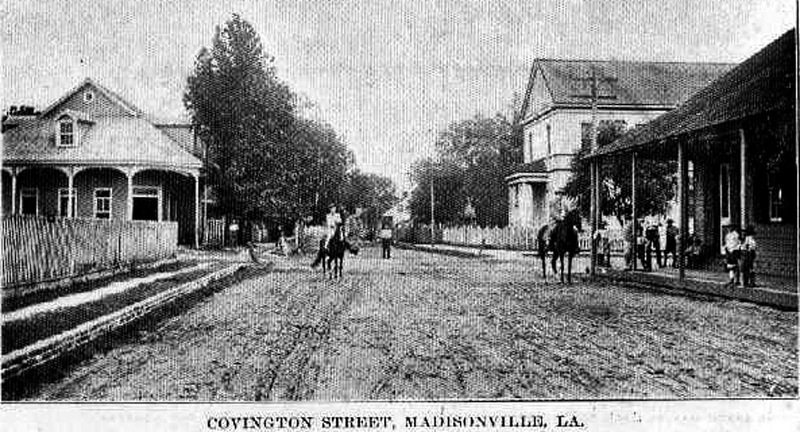 View looking southward on Covington Street in Madisonville. 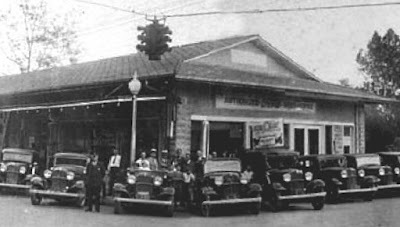 The old Dendinger Bar is on the right. In present day the Piggly Wiggly would be on the Immediatel left and the Dendinger House would be on the immediate right. To the right and down the street, the two story building was the United Friends Benevolent Association Hall, built in 1891. That structure, a music and community house, burned in 1920. 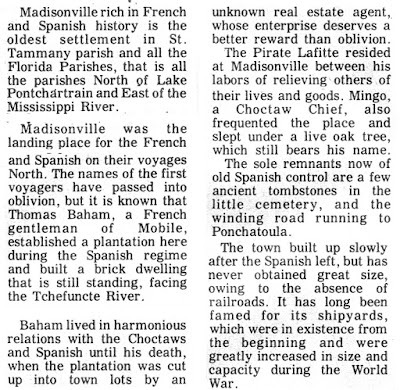 In 1973, the St. Tammany Farmer published the account seen below. 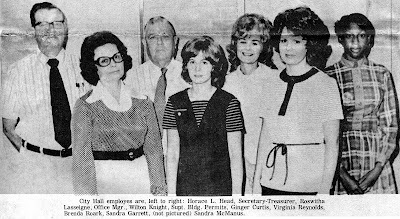 For a more definitive history of Madisonville, get ahold of a copy of The Madisonville Issue of the St. Tammany Historical Society's Gazette, published in March of 1980 and written by Ethel Haas Boagni. Artist Winky Chesnutt's pen & ink sketch of the Tchefuncte River Lighthouse. CLICK HERE for more information about the lighthouse. where the road bends. Click on the image to make it larger. 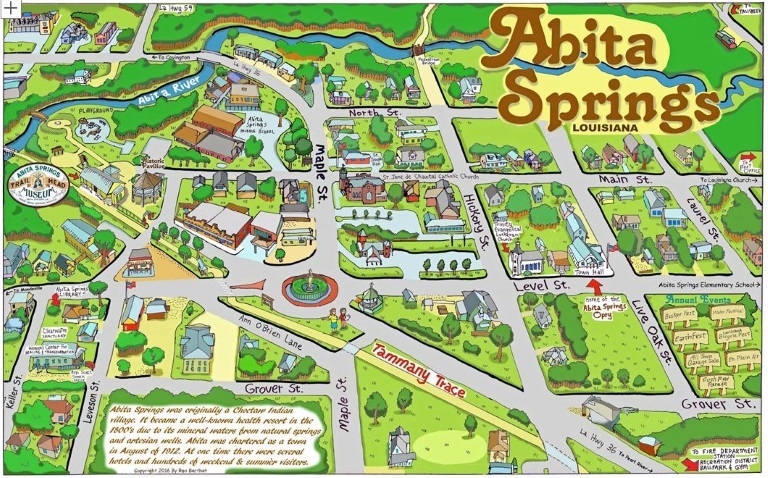 The Abita Springs pictorial map I drew last year has been posted online as one of the digital maps available for viewing at http://shoplocalusa.online/ . 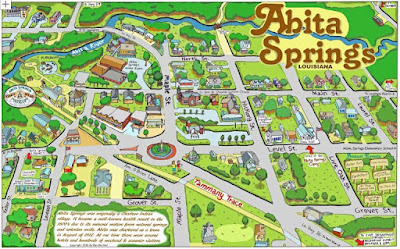 Prints of the Abita Springs map, signed and numbered by the artist, are available for purchase at the Trailhead Museum in Abita. A portion of the proceeds from the sale of the maps goes towards funding the operation of the Trailhead Museum and its informative historical displays. 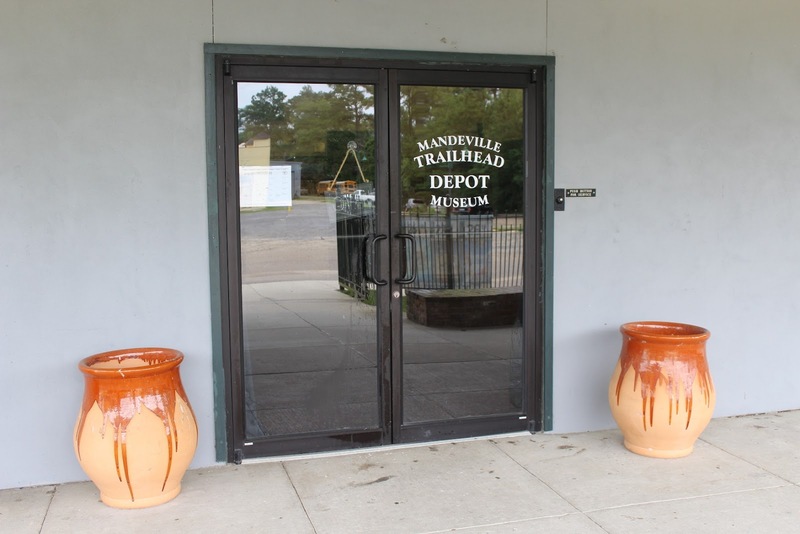 A worthwhile trip through the corridors of local history is in store for those who visit the Mandeville Trailhead Museum, located on the west end of the Mandeville Trailhead complex next to Tammany Trace. The museum at the trailhead (the actual address being 675 Lafitte Street) is open Saturday mornings from 10 a.m. to 1 p.m. and Monday through Wednesday 10 a.m. to 3 p.m. The one-room museum offers an entertaining and informative overview of Mandeville history, its people, and its promise. The displays are quite detailed, combining pictures with text, telling the stories of the people who made the community a shining example of how high ground, convenient access (via boats and trains), and plain old innovative initiative can make a place special. There are videos to watch, models to marvel at, and interesting tidbits about community life that you will find nowhere else. Here are some pictures of the exhibits. A model of the "water slide" that used to be off the Mandeville lakefront. 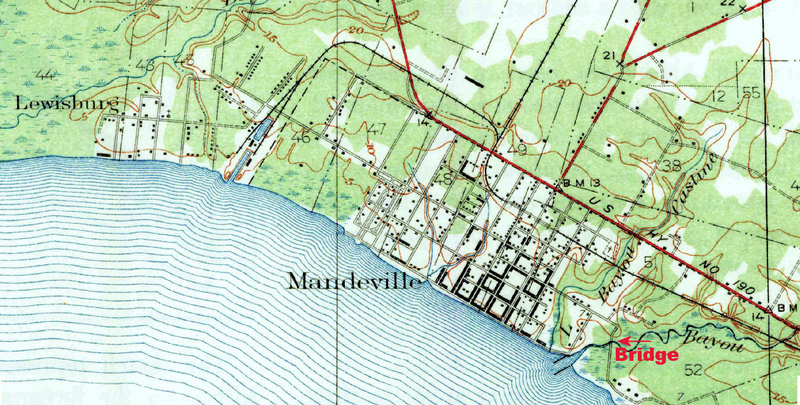 It winds through some of the lesser known aspects of Mandeville history, from the original plans to its transition from a lakefront resort town to a quiet bedroom community of New Orleans (as a result of the Lake Pontchartrain Causeway). 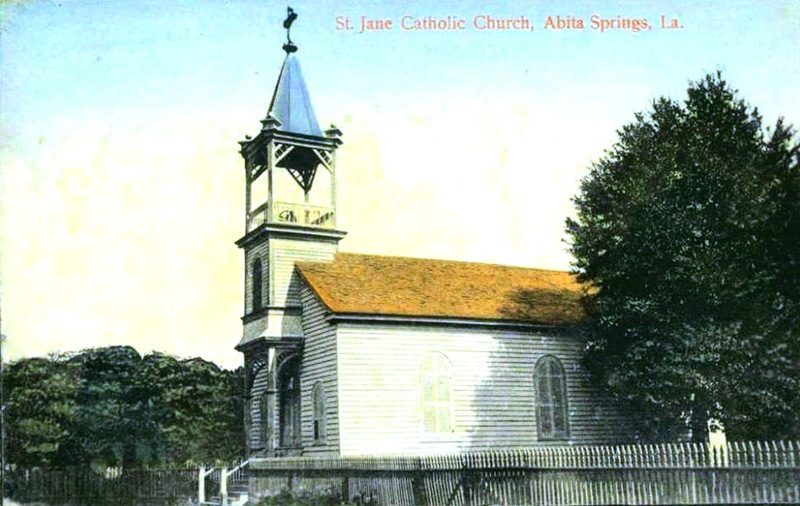 The history of St. Jane de Chantal Parish Church in Abita Springs was written by Fr. 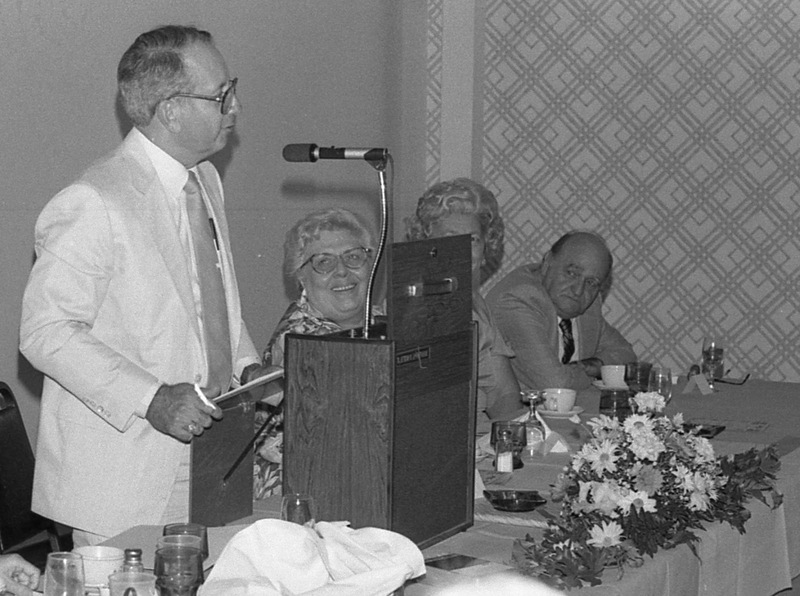 Francis Sanders, O.S.B., in 1987, for the 100th Anniversary of the church's founding. The first white man to set foot on what is now St. Tammany Parish was Pierre LeMoyne, Sieur d’Iberville. 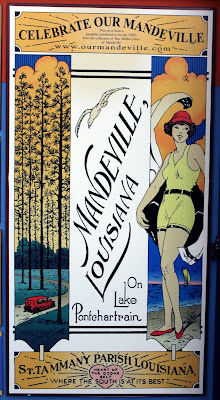 Exploring a short cut by canoe from the Mississippi River to the Gulf, he crossed over (and named them) Lakes Maurepas and Pontchartrain. He landed at Goose Point, which is south-west of today’s Lacombe, on March 27, 1699. Finding the mosquitoes intolerable, and the land too marshy, he scored the area unfit for settlement, leaving it to the native Americans. As early as 1725 the lake became a trade route between the Indians on the north shore and New Orleans, on the south. Some white people began to settle on the north shore. Early settlement by whites in the parish took place mostly along the rivers and bayous running into the lake. St. Tammany Parish, as a political entity, was established by Governor Claiborne in 1811. (The Catholic Church has no ‘Saint Tammany’! The name ‘Tammany’ is generally thought to come from Tamanend, a Delaware Chief of the 17th century, who befriended the white man in the early days of colonization. 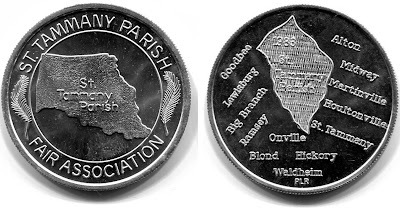 Since many of the civil parishes in Louisiana are named after saints (Saint Bernard, Saint John, Saint Charles, etc.). The prefix ‘saint’ was tagged onto Tammany also. Hence, “Saint” Tammany). 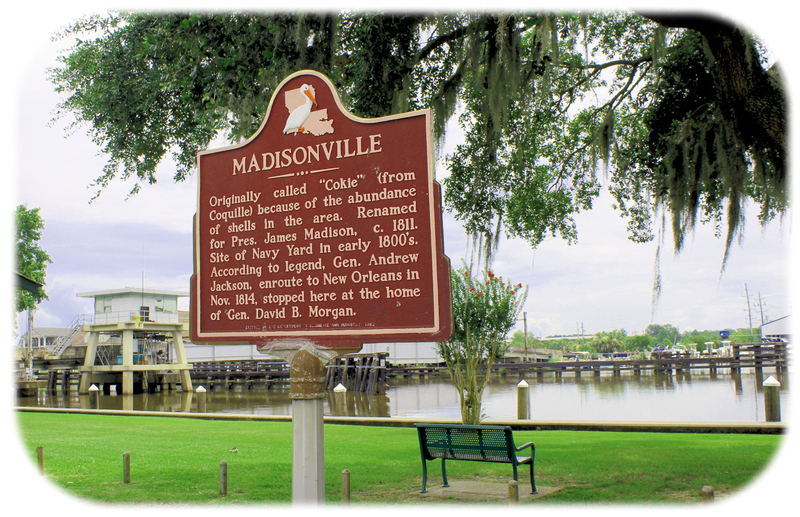 Catholic churches were early established in Madisonville, Mandeville and Covington. 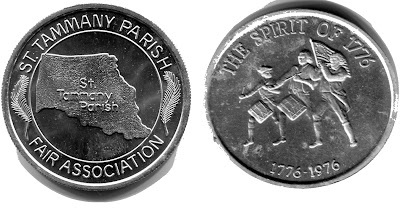 All the rest of St. Tammany was designated as the “Mission of St. Tammany”. The Bishops and Archbishops of New Orleans (-it became an Archdiocese on July 19, 1850-) would appoint “Missionaries of St. Tammany” to tend to the spiritual needs of the settlers. A census of 1860 showed only 5406 white people in all of St. Tammany Parish. The most famous of these missionaries is Pere Adrien Rouquette, of course. Eventually he worked mostly with the Choctaw Indians, and became so close to them, they gave him the name ‘Chata-Ima’, which means ‘Like Choctaw’. Other priests were as sacrificing as he, such as Fathers (Canon) Hyacinth Mignot, George Lamy, Joachim Manoritta, Lavaquery, G. M. Geraud and others. 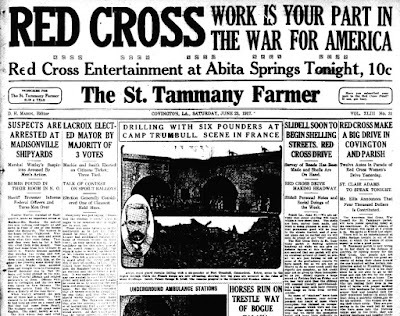 Abita Springs was part of the ‘Mission of St. Tammany’. 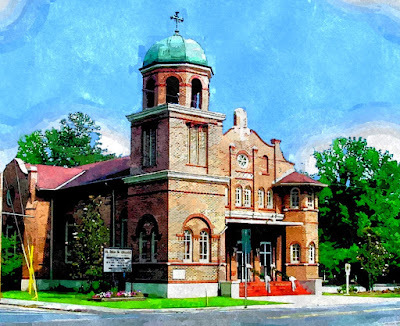 Lawrence Flot (a parishioner, who died in 1979, at the age of 81) recalled that around 1825 his grandfather built a chapel on his property (now the Dirmann property on Level St.), and Mass was offered there a few times a year when a missionary came around. He would also baptise, marry, hear confessions and bless graves. Lawrence recalled the names of only two of these missionaries: Canon Mignot and Pere Rouquette. In the mid-1800’s Captain Joseph Bossier owned a large track of land in the Abita area. He and Colonel William Christy began promoting the area as a health and recreational resort because of its mineral springs, the ozone air, and beautiful terrain. But difficulty of access made the response slow. 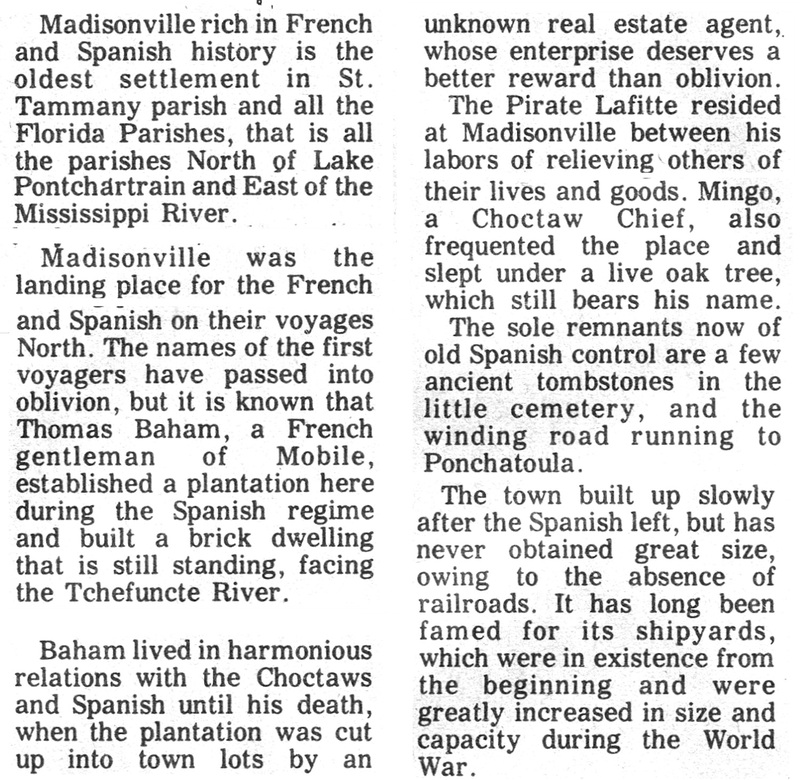 After crossing Lake Pontchartrain, one journeyed from Madisonville up the Tchefuncta to Covington by boat, and from there took a rough 3-mile overland trip in a 6-person buggy wagon to Abita. Around 1900 trains provided a much easier means of transportation from New Orleans, and Abita entered its golden era as a famous health resort and recreational area. 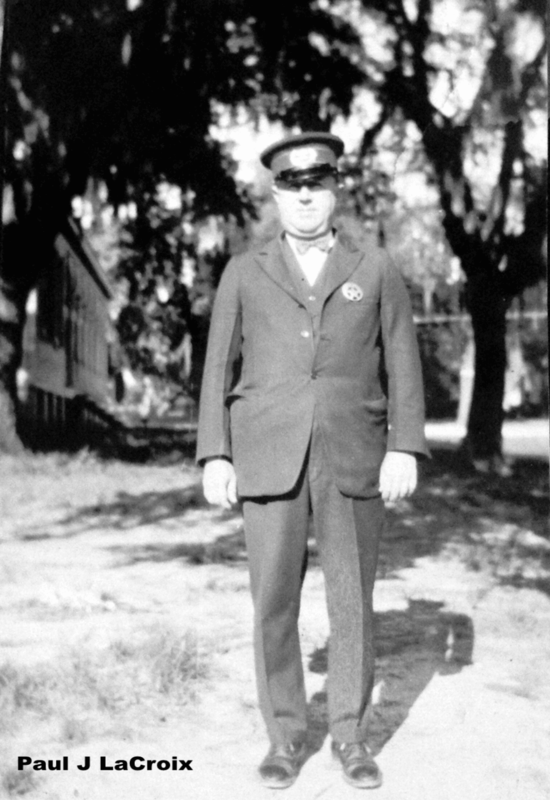 Often two trains at a time, each with 8 to 10 passenger cars, regularly brought hundreds of people to Abita. At its peak Abita had about 450 permanent residents and 2,000 summer residents. Hotels and boarding houses were plentiful, and cottages everywhere. It was not unusual for the Mutti Hotel to prepare for 200 or 250 people each meal, Access to Abita from Mandeville was improved with the laying of rail tracks around 1910. A motor car similar to the New Orleans streetcar traveled on it for about five years, and then an electric car used the tracks for a few years. Fare from Mandeville to Abita – 15 cents; from Abita to Covington – 5 cents. The tracks went along what is now St. Mary Street, and the depot was near Morgan’s swimming pool. But just as the trains brought many here, so the advent of better roads and cars lured people to other areas. And Abita’s boom was over. It dwindled to its present status of a quiet, small town – no longer famous, but still enjoying its healthful water, fresh air and beautiful surroundings. 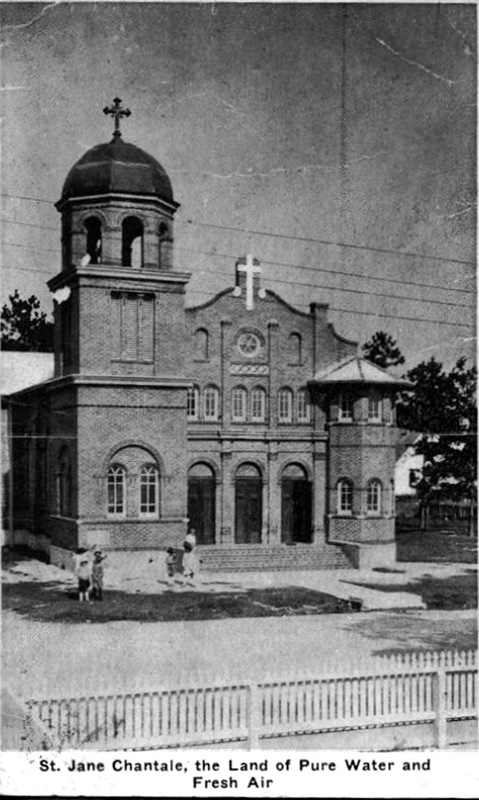 In 1884 the Abita area became a mission of the church in Mandeville, then known as St. Theresa Church, and now as Our Lady of the Lake. Father Eugene Aveilhe was pastor then. He entered the first baptism in the mission’s registry on August 12, 1884. 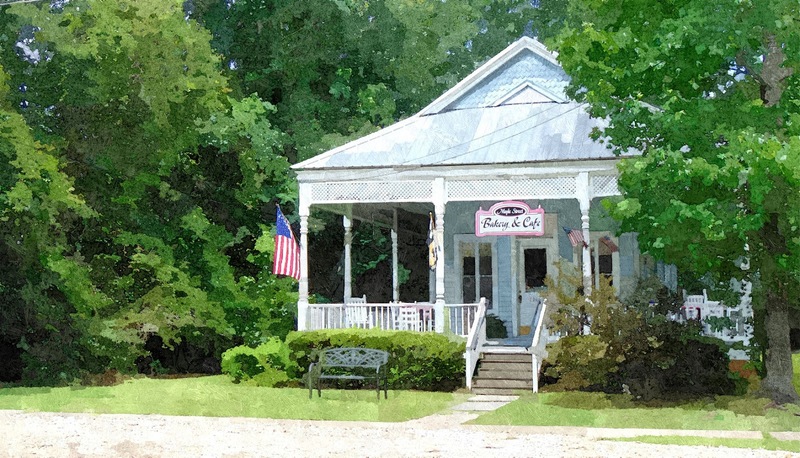 He labeled the registry simply as ‘Ecclesia in Abita Springs’ (‘the Church in Abita Springs’), since the mission had not yet been given a name. 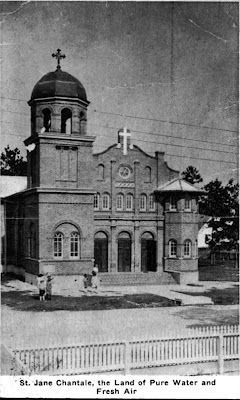 The ST. TAMMANY FARMER issue of September 10, 1887, reported that Abita’s first church was erected and dedicated on September 7, 1887, and given the name ST. JANE DE CHANTAL MISSION. 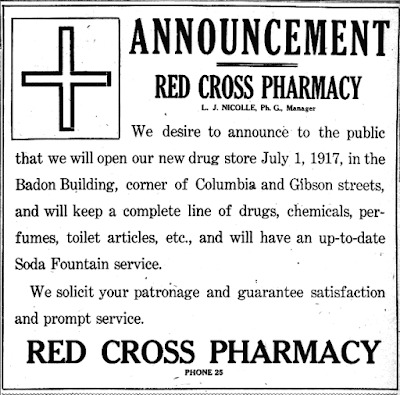 It was located on Keller St. at Second St., one block from the present library. (Because of this, the year 1887 was chosen as the centennial year of the St. Jane community. The centennial celebration was delayed to October 18, 1987, so as not to interfere with Pope John Paul II ‘s visit to New Orleans on September 12th). Father Aveilhe and Canon Mignot officiated at the dedication. The church bell was blessed by Father Aveilhe on Sunday September 16, 1887. He performed the first sixteen baptisms in the new mission, the last being in 1890. 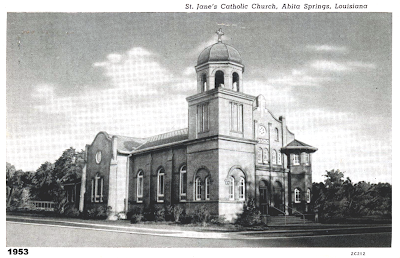 In 1889 St. Jane Mission was transferred to the care of St. Peter Church, Covington. The Pastor was Father Joseph Koegerl, a secular priest. This amazing priest, semi-retired, zealously cared for Abita, Madisonville, and Bedico while pastor of Covington. He did this all while traveling by horse and buggy. He obtained help from the priests of the new Benedictine St. Joseph Abbey, established near Ramsay (now St. Benedict) in 1902. They alternated with him saying Masses at his missions on weekends. On retiring in 1916, he recommended to the Archbishop that the Benedictines be assigned in his place. He died at the Abbey in 1925* Father John Burger, O.S.B. succeeded Father Koegerl as pastor of St. Peter, with Abita still its mission, from 1916 until 1920. In 1920, St. Jane Church became independent of St. Peter, Covington, and Father Martin Barre, O.S.B. became the first Administrator of the new quasi-parish (quasi = as if it were). Father Martin signed the baptismal registry as ‘pastor’, but more properly he should have signed as ‘administrator’. It was he who acquired all of the property now comprising our present church property, excepting the two lots on which the CCD building stands. By 1912 he had acquired the three lots closet to the corner of Maple and Main Streets (on which the present church and rectory are). 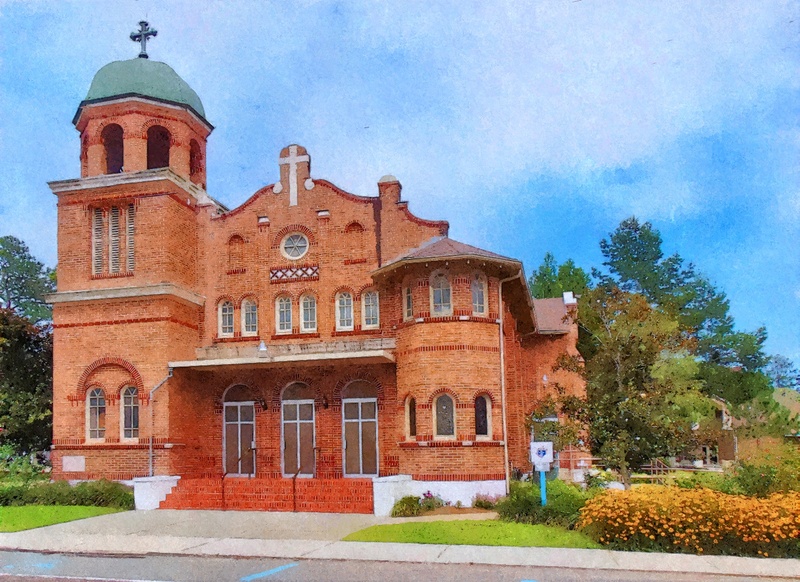 In 1923 he erected the new St. Jane’s Church, the first brick church in St. Tammany. Lawrence Flot constructed its ceiling. The cornerstone, dated 1924, was laid by Archbishop Shaw. Cost of the building was $35,000. 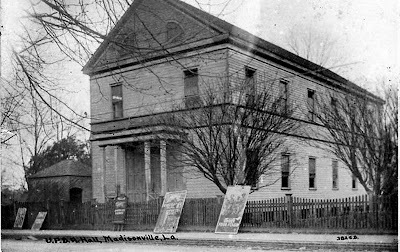 Father Martin acquired two more lots on Maple St. adjourning the church, and had the old (first) church moved onto them to serve as a hall. He lived in the tiny room above the new church’s baptistry (now the confession room), and used one of the sacristies for an office. Shortly before leaving St. Jane, he acquired the two lots at Main and Hickory Streets, and the house that was there became the first rectory. (it was sold and moved away in 1971). Father Martin’s pastorate extended from 1920 to 1930.He died in 1951. His successor was Father James Erickson, O.S.B. These were the depression years, felt much by the people. Often the Sunday collection was about $5- The Abbey furnished him with food and gas. In return, he taught a class at the seminary. T1 is to his credit that the debt incurred to build the church war. paid off during his administration. An avid tennis fan, he built a clay tennis court and soon just about every kid in town was lined up, awaiting their turn to play. But Abita Springs' ‘open range’ then, and especially after a rain, cows would sink holes in the court as they walked over it. So, he decided to cement the court. He asked a contractor how much it would cost, saved that much, and told him to start the work. But halfway through, the contractor told him he under estimated, and the money ran out. So, Father James had to borrow the rest from the Abbey. 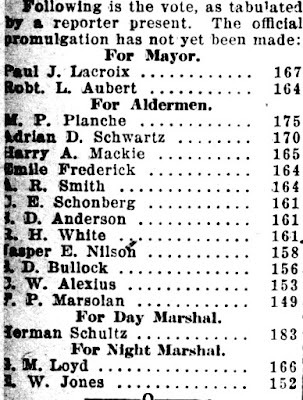 He served from 1930 to 1942. Father Augustine Bloyin, G.S.F. followed with a short pastorate, from 1942 to 1943. He left to join the Trappist Monks. Father Thomas Schwickert, a Cistercian Monk from Germany, but residing at our Abbey, was the next pastor. In September, 1945, a wire in his car shorted, setting fire to the garage, which set the old (first) church afire, burning it to the ground. The day before, Abita had just finished putting in the water lines for fire hydrants – but they were not yet hooked into the water source! Father Thomas was pastor until 1949• He died the following year. Father Athanasius Brugger, C.S.B. was the next administrator. During his ministry, the Archdiocese held its Seventh Synod in June, 1949, to determine the policy of the Archdiocese on doctrine, discipline and liturgy. The proceeds of that Synod were promulgated in October, 1949. In it, it declared that , as of that day (the promulgation), St. Jane de Chantel Church in Abita Springs was elevated to the status of a parish. Thirty-two years ago, on April 2, 1985, History Professor C. Howard Nichols gave a talk to an "in-service" media library class held at Madisonville Elementary School. He told how he got started in writing St. Tammany Parish history, as well as recounting earlier attempts at recording historical events in proper order. 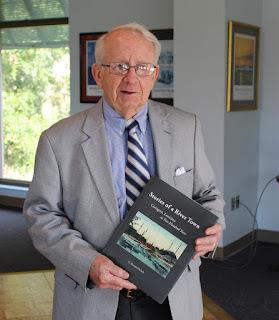 Dr. Nichols with his latest book "Stories of a River Town"
Dr. Nichols noted that the writing of history, in the early years, was done primarily by people writing family histories or the histories of the community churches. "My first acquaintance with St. Tammany's history came from various references in the Federal Writers' Project," he said. "The Louisiana State Guide." When his family purchased an abandoned farm near Lacombe in 1944, he met some of the Indians of the vicinity and gained an appreciation of the area's historical figures, namely Chahta Ima, Father Adrien Rouquette. "Some years later, when my father had acquired an old store on Columbia St. in Covington, I met Adrian D. Schwartz," Nichols explained. 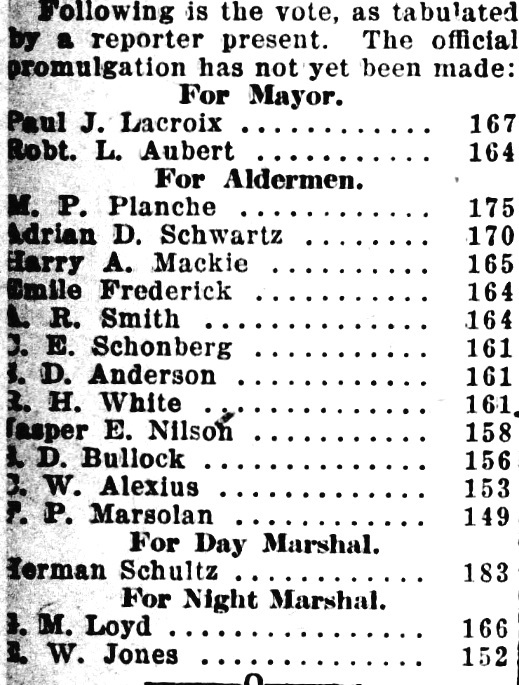 "Mr. Schwartz shuffled down the street from his quarters above the Von Schneidau Clothing Store in the Patecek Building on the corner of Columbia and Boston Streets." He lived and maintained a law office above the store, always tending a few flower boxes as well as keeping a "feline menagerie" on the flat roof above the Norman Haik store, Nichols recalled. "I finally entered into that special province of Mr. Schwartz when, as a graduate student in history at LSU, I met him on the street and expressed an interest in his history of St. Tammany Parish," Nichols said. For years people had commonly reported that Adrian Schwartz was writing a history of St. Tammany. "I don't know why he agreed to show it to me; maybe he was flattered by a young man's interest in his work. In any case, he pointed to a large cardboard box filled with the typed manuscript pages," he said. "In between the typed pages were sandwiched deeds, legal briefs, tax receipts, and all of the other documentation of his history." Even though Schwartz was cautious about the young Nichols, he opened the manuscript and read aloud sections of his account. "I remember being impressed with the manuscript and its documentation, and I confided in my attorney friend Garic Barranger that if Mr. Schwartz died while I was away at school, someone should be sure and salvage the manuscript," he recalled. Two short versions of the Schwartz manuscript reached print, the first being in a publication titled "St. Tammany Parish Resources and Facilities published in cooperation with the state of Louisiana in 1953, and the second ten years later, when the Covington City Council published Sesquicentennial in St. Tammany. 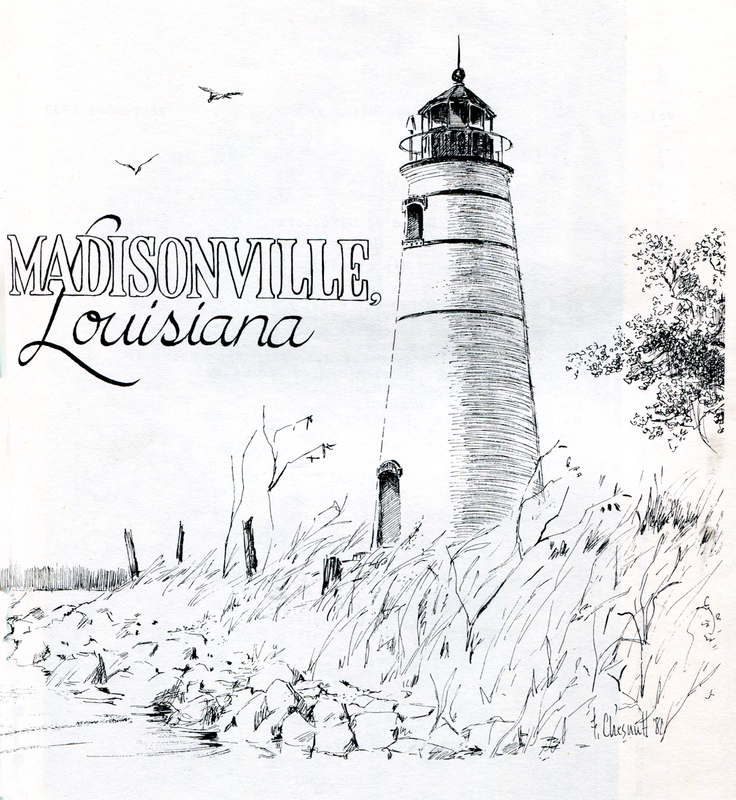 That publication was subtitled "The Early Years of Covington, Madisonville, Mandeville and Abita Springs, Louisiana." The writing of St. Tammany Parish history is primarily a function of the last fifty years. Prior to that time the parish was both rural and poor. People writing the history of this region wrote about their families or their churches. 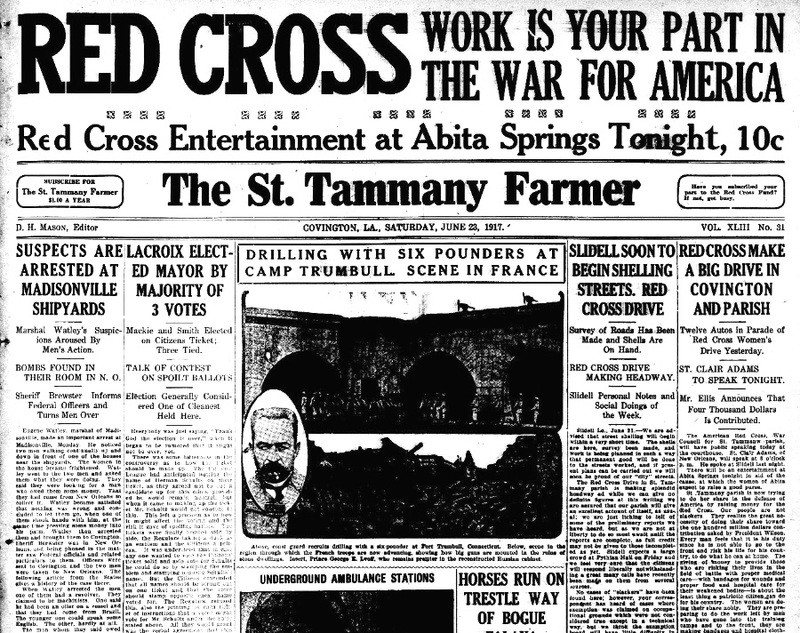 Occasionally, a local paper would print a Civil War reminiscence, but the central endeavors of making a living, raising a family, and working out one's personal salvation through a rural Baptist Church or with the assistance of the designated saints of the Roman Catholic Church filled the lives of most St. Tammany residents. My first acquaintanceship with St. Tammany's history came from various references in the Federal Writers' Project, Louisiana State Guide. When we purchased an abandoned farm near the village of Lacombe in 1944, I encountered some of the Indians of that vicinity and that led me to an appreciation of Chata Ima, Father Adrien Rouquette, who was the subject of Dagmar Renshaw LeBreton's biography under that title. Some years later when my father had acquired an old store on Columbia Street in Covington, I first met Adrian D. Schwartz. Mr. Schwartz, as I always called him, shuffled down the street from his quarters above the Von Schneidau Clothing Store in the Patecek Building on the corner of Columbia and Boston Streets. Mr. Schwartz made an almost daily pilgrimage down Columbia Street and always returned with a brown paper bag under his arm. During the years of my youth he lived and maintained a law office above the store. He tended handsome blooms in flower boxes and maintained a feline menagerie on the flat roof above the Norman Haik Store. I finally entered into that special province of Mr. Schwartz when, as a graduate student in history at LSU, I met him on the street and expressed an interest in his history of St. Tammany Parish. For years people commonly reported that Adrian Schwartz was writing a history of St. Tammany. I don't know why he agreed to show it to me; maybe, he was flattered by a young man's interest. In any case he pointed to a large cardboard box filled the typed manuscript pages. In between the typed pages were sandwiched deeds, legal briefs, tax receipts, and all of the other documentation of his history. Cautious about this young stranger, he cut into the manuscript and read me sections of his account. Interspersed with the reading came questions about histroy and demands that I recite Shakespeare and other classical writers. Many of his commands, I fear, went unanswered. I remember being impressed with the manuscript and its documentation, and I confided in my attorney friend Garic Barranger that if Mr. Schwartz died while I was away at school., someone should be sure and salvage the manuscript. Two short versions of the Schwartz manuscript reached print. The first appeared in a publication titled St. Tammany Parish Resources and Facilities Published in Cooperation With State of Louisiana Department of Public Works Planning Division in 1953. Ten years later The Covington City Council published Sesquicentennial In St. Tammany subtitled The Early Years of Covington, Madisonville, Mandeville, & Abita Springs, Louisiana by Adrian D. Schwartz. I am grateful that he managed to see some of his life-long project appear in print. When Mr. Schwartz died, my friend and Adrian's, Nikki Barranger, looked for the cardboard box with the manuscript and documentation. He never could locate it. Subsequently, heirs offered a manuscript to the St. Tammany Historical Society but it was not the manuscript I had seen. We may never learn what happened to that version and its accompanying documents. Early in the life of the St. Tammany Historical Society, it inaugurated a publication program. 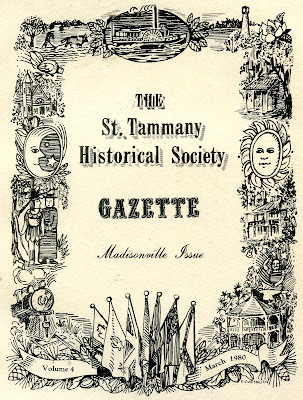 That first volume of the St. Tammany Historical Society Gazette threatened the very existence of the organization as the printing bill far exceeded our prospective revenues.
" We had an over-zealous editor and a hungry, but careless, printer. It proved to be a dangerous combination. Judge Steve Ellis and others agreed to seek to rescue the fledgling organization by seeking business sponsors etc. When the exorbitant printing bill had been repaid, more modest goals were set for subsequent publications. Several annual issues appeared which contained a variety of materials relating to parish history. I edited the third volume (issued in 1978) and was particularly proud of two articles which I solicited. The widow of the late Governor Richard W. Leche wrote a beautiful essay titled "Our Years in St. Tammany" and Mary Frances Morgan offered an account of her father-in-law, the late Lewis Morgan. Subsequent issues included the fine history of Madisonville by Ethel Haas Boagni, a pictorial history of St. Tammany, and most recently, the very lovely Home Cooking: Recipes, Homes and Legends of St. Tammany Parish, La. In 1978 the Poole Lumber Company reprinted "Along the Line of the New Orleans Great Northern R.R. in Louisiana" originally issued by the Southern Manufacturer, 541 Camp Street, New Orleans, La. 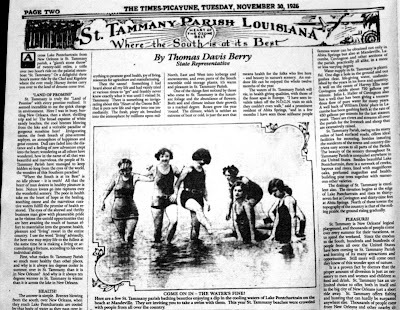 The photographs, sketches, and advertisements tell us much about St. Tammany life in the past. At the request of Miss Jane Dutsch of Madisonville I prepared a brief history of the parish for an address to the retired teachers of St. Tammany delivered a number of years ago at Holy Redeemer College at Lacombe. 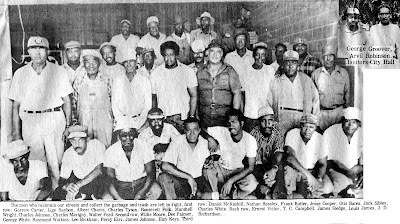 At the time, I planned to pursue the project,-but then I learned that Judge Frederick S. Ellis had undertaken the writing of the parish history. 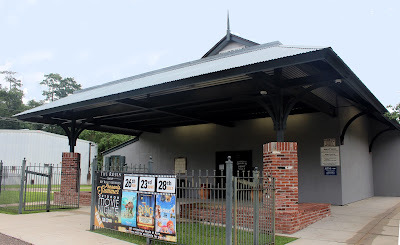 I put mine aside and instead wrote Tanqipahoa Crossings: Excursions into Tangipahoa History which appeared in 1979. In the meantime I occasionally talked with Steve Ellis about his book and eagerly awaited its publication. Steve Ellis came to Covington as an associate in the legal office of Dalton Barranger on New Hampshire Street. He and his wife Betty rented the old Overseer's House on the grounds of the St. Tammany Parish Courthouse at Claiborne Hill owned and occupied by Robert and Katherine Lobdell. Betty and Steve were newlyweds and two sons and a long life of accomplishment intervened between those early days and Betty's death from cancer. St. Tammany L 'Autre Cote Du Lac appeared in 1981 and is dedicated to the late Betty Dahlberg Ellis. Covington novelist ,Walker Percy, in his forward to the volume commented ..."such a talent for dissent, whether from a stalwart frontier spirit or plane unregenerate human cussedness, is remarkable. . . . 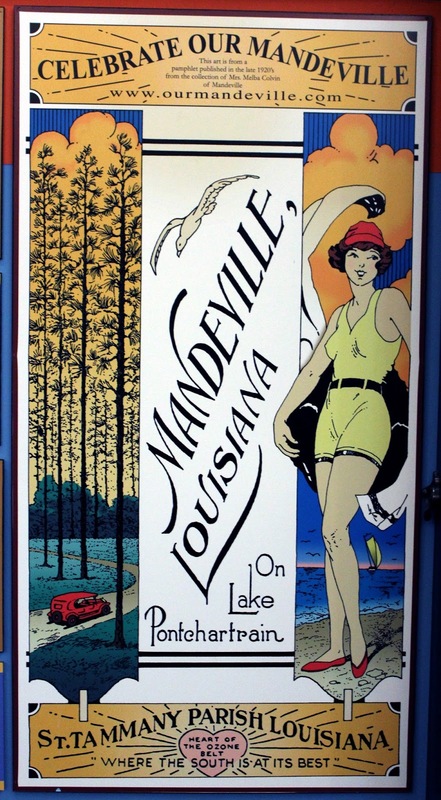 Indeed St. Tammany Parish turns out to be a microcosm of the encounter of two cultures, the collision of the Creoles from the South with WASP invaders from the North—with mostly happy and interesting results." 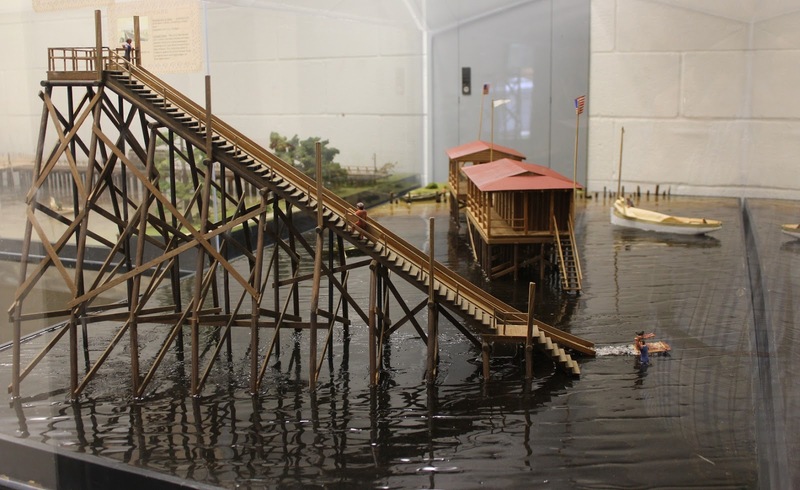 Ellis's St. Tammany tells the story of the east and north shores of Lake Pontchartrain from pre-Columbian times to the eve of the Twentieth Century and sometimes beyond. Steve, on more than one occasion, has indicated that he terminated his account at the turn of the century for it was then that he began to encounter people that he knew. The Pelican Publishing Company evidently originally planned to print the work without notes. That decision changed and the resulting notes are frustrating and confusing, but diligence will lead one to the sources. Published under the auspices of the St. Tammany Parish Bicentennial Commission, Ellis's St. Tammany eschews the twentieth century. It appears to me that the best part is the last and 2U(that) Ellis has not explored. Hence my own present project to develop a history of Twentieth Century St. Tammany. Reflecting both my interests in the Depression, Huey Long, and Richard Leche, I have begun my research in the period 1929-1939. College professors and fathers of small children find that there are many who seek part of their time and attention and consequently, my St. Tammany project is the something extra I always want to get to but seldom manage. I have.read a good deal of the St. Tammany Farmer, I have explored the archival resources of LSU in Baton Rouge including the extensive papers of the late Richard W. Leche, and I have begun a program of interviewing St.Tammany folk. As a practicing historian I am particularly interested in change and the major changes of St. Tammany history have come in the Twentieth Century. The Indians left, roads began to replace trains and boats as basic transportation. Schools became commonplace and free. The Causeway linked the northshore with the Crescent City just as the twin bridges of the Interstate join Slidell with New Orleans. A program of public assistance commonly referred to as "The Welfare" came to the parish. Political figures established major estates which contributed to the creation of the "Gold Coast" along the Tchefuncte River. World Wars and police actions affected the parish. The massive timber cover lumbermen cut at the beginning of the century is today removed by developers of shopping malls and residential communities. 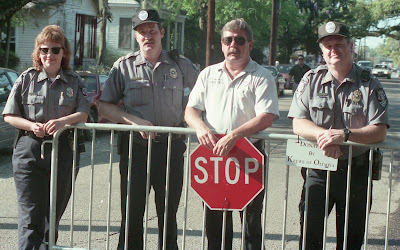 Life in America and St.Tammany desegregated. As thousands of New Orleanians fled to the northshore upper-middle-class life styles and Republican politics have permeated much of St. Tammany. In short there has been, is, and will continue to be massive change in St. Tammany parish. My intention is to document this change in a social history of one of America's loveliest regions. The Farmer announced a gas-electric train on the Gulf, Mobile and Northern Railroad which would consist of "motor, baggage, express car, day coaches, and an observation car. ... When the gas-electric train shall have been put into regular service we will have a one-hour forty minute schedule from Covington to Canal Street, and with the low fares there should be a material increase in passenger traffic to all points of the shore line. There will not be the disagreeable dust to contend with as is encountered on the buses, and there will be no smoke or fumes from a cumbersome engine... the coaches will be equipped with comfortable chairs, the windows screened and the vestibules closed. There will be lavatories, toilets, etc., of modern construction. The observation car will be a palace, and no doubt will be an attraction for commuters where the usual game of bridge or draw can be indulged in with utmost comfort, and those desiring to read or write will have every convenience at hand. For ease and comfort of riding there will be hardly anything that can surpass it. The coaches will be on roller bearings and will operate as smoothly as an automobile on a tile floor." No doubt the improved transportation brought new citizens to St. Tammany but local attitudes probably reflected those of a much earlier time. The New Orleans Republican of Sunday, May 3, 1874 carried a piece advertising the desirability of St. Tammany for potential agricultural operations but it closed cautioning ..."There is no demand here for lawyers, doctors, music masters, dentists, carpenters, painters, office seekers or politicians." The advent of the automobile changed life in St. Tammany. By the end of the twenties car accidents were keeping doctors and wreckers busy. The October 26, 1929 issue of the Farmer reported ... a Ford roadster, driven by a young man, ran into a herd of cattle on the Hammond highway just west of Covington and when the car was finally stopped one 110 0 pound steer was astride the radiator and another tucked snugly away on the running board (if such a thing can be imagined). Both animals were killed and the car almost wrecked." These newfangled machines produced no end of damage and consternation. F. J. Heintz suffered injuries while cranking his car. The popular "Bud" Heintz did not notice that the car was in gear when he began cranking the engine. "The car started and knocked him down, hit a lawn mower and knocked it through the rear wall of the garage and generally playing havoc in the garage while "Bud" was lying on the floor." The roads of the parish in the twenties were dirt and gravel. 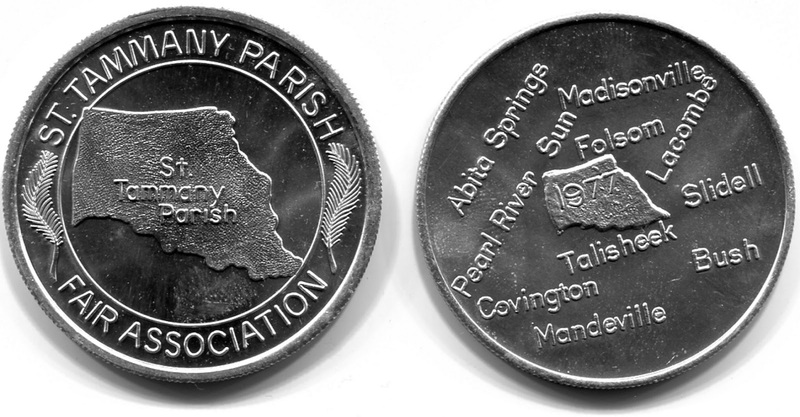 In the spring of 1929 motorists of the parish enjoyed a new service when the State Highway Commission drove a heavy truck carrying a magnet over all state and federal roads in the parish to pick up mails, tacks, etc. When the truck completed the Abita to Covington road it had picked up over one hundred pounds of nails, wire, tacks, bolts, nuts, and hundreds of other metal articles. Over a ton of metal objects were picked up between Covington and Slidell! They had a heavy litter problem! Paved streets and highways marked progress. 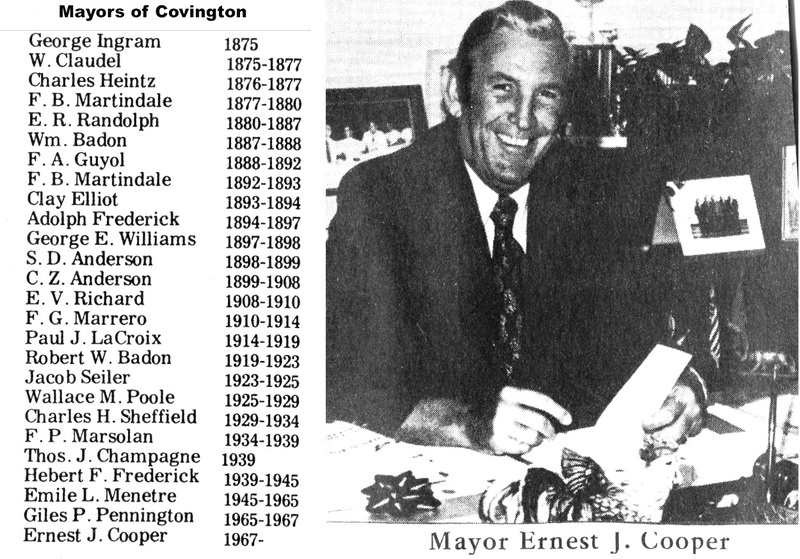 Covington began a city paving program in the late twenties, but the improvements generated new problems. The Covington City Council found it necessary to pass an anti-skating ordinance as the old time fad of roller skating returned as the town's 'streets'were paved and with many children dashing back and forth on paved streets motorists were hard put to avoid tragic accidents. 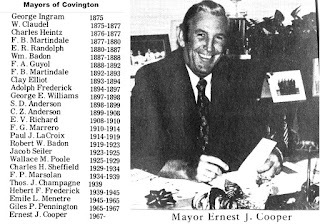 The civic/improvements in Covington caused the local editor to boast on January 26, 1929: If you folks out of Covington happen to meet a Covingtonian and his chest is all stuck out . . . it is just because he is proud of the citified air his town has taken on. You see it is like this: Lately our town has put down a large area of fine paved streets, a white way brilliantly illuminates the principal thoroughfares, and Thursday the new traffic signals were turned on, and if all that together don't make we Covington folks feel like big-town people—well what will?" 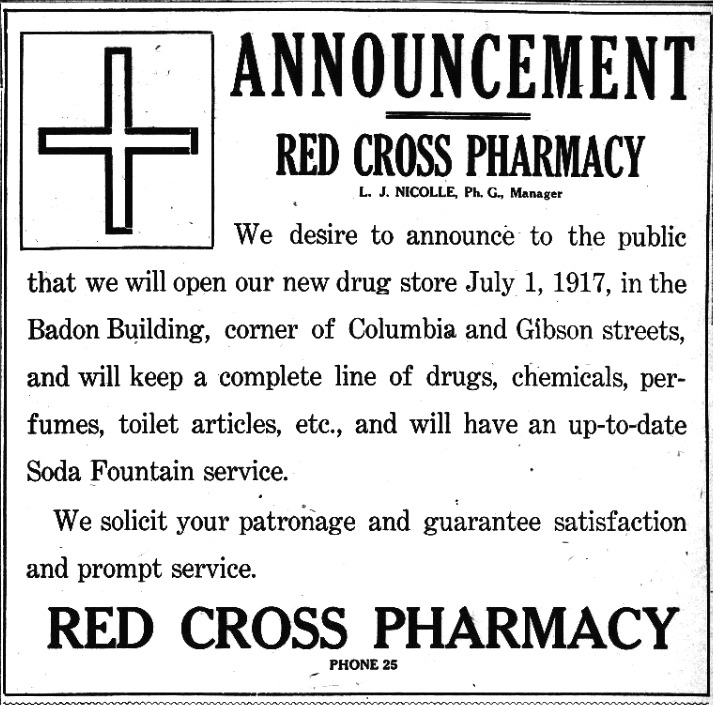 This is a sample of the kind of thing that I am working on now as a part of a history of St. Tammany Parish in the Twentieth Century." And that was the end of Dr. Nichols talk in 1985. Dr. Nichols recently spoke to a gathering of the St. Tammany Library Foundation about St. Tammany Parish History. To read more about that, CLICK HERE. Last year he spoke to a Covington conference of the Louisiana Trust for Historic Preservation. For more information about that meeting, CLICK HERE. He also found some information on how much it cost to start a small farm in St. Tammany Parish in 1874. CLICK HERE to read about that discovery. To listen to an audio file of Dr. Nichols telling about St. Tammany Parish history, CLICK HERE. In 2009 the Talented Arts Program of the St. Tammany Public School System won "The President's Award" from the parish government's cultural affairs commission at the fourth annual St. Tammany Parish President's Art Awards. The annual awards recognize six outstanding artists and arts patrons in the fields of visual art, culinary art, performing arts, music and writing. Stephen Cefalu, vice chairman of the Parish Commission on Cultural Affairs, emceed the presentation. The event took place at the Louisiana Medical Center and Heart Hospital in Lacombe with TAP Coordinator Debbie Lefort and Assistant Coordinator Donna Laurent receiving the award. 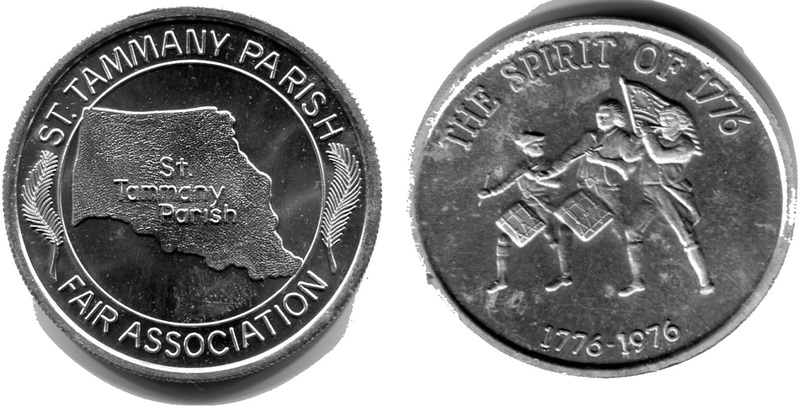 In the 1970's and 1980's the St. Tammany Parish Fair Association issued several doubloons in connection with the annual event. Here is a picture of three of them, both sides. What was going on 100 years ago this week? The following link is provided by the Library of Congress and its Chronicling America service. 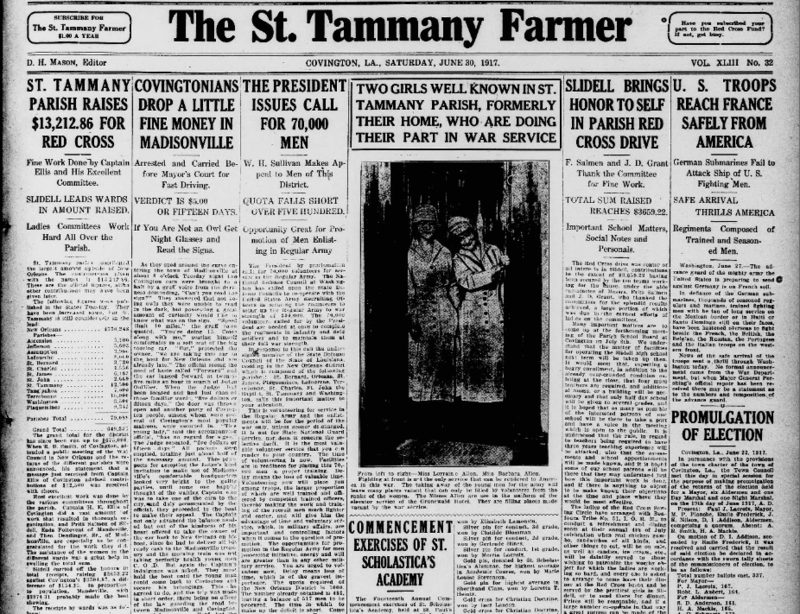 CLICK HERE for a link to the St. Tammany Farmer edition of June 23, 1917. Click on the image below to enlarge it. Here's a link to the 1972-1973 Yearbook for Pine View Middle School in Covington. CLICK HERE to see the yearbook. 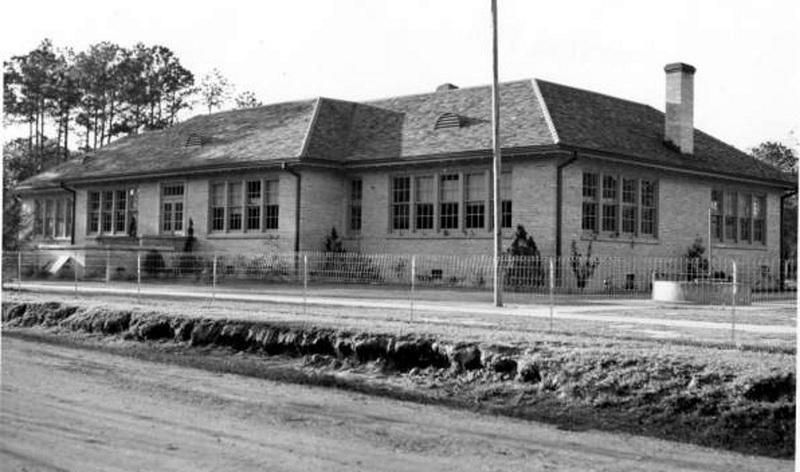 Here's a link to an Adobe Acrobat PDF File containing the 1967-1968 Mandeville Elementary School Yearbook from fifty years ago. CLICK HERE to go to the yearbook. 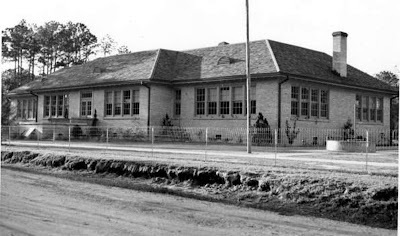 This photograph of the Pearl River School building in 1937 came from a Works Progress Administration (WPA) photograph collection. To see what the building looked like in 2013, CLICK HERE. 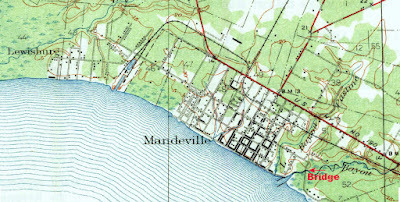 Do you know that the drainage waterway that empties into Lake Pontchartrain just west of Mandeville Harbor is called "Little Bayou Castine"? That's to distinguish it from the other Bayou Castine that comes from U. S. Hwy. 190 and beyond (at least alongside Pelican Park) and empties into the lake at Mandeville harbor. Click on the map below to enlarge the image. Not only that, but as the 1935 topo map below shows, it looks like there used to be a bridge (?) at the east end of Madison St. that went over Bayou Castine and followed a road into Fontainebleau State Park camp area. 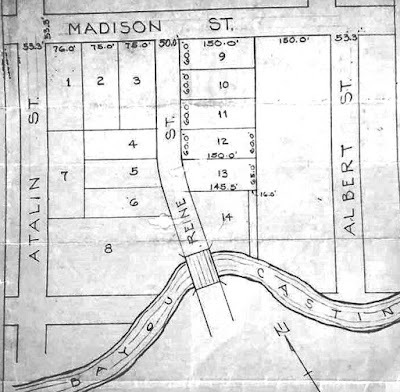 This 1952 map shows the bridge over Bayou Castine. It was on Reine Street off of Madison St.
Click on the image above to make it larger. 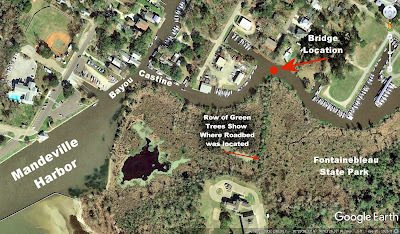 This photo from 2014 Google Earth aerial photography shows a row of green trees where the roadway used to be that led to the bridge over Bayou Castine.